The Last Days of an Immortal is a fascinating graphic novel of the far future. It tells of alien races intermingling and of bizarre alien wars that are barely comprehensible by ordinary people. It tells us of characters who live forever and who can choose their own deaths, but who still have complex emotions and interpersonal relationships that drive their lives. It tells of celebrity and responsibility, minds, bodies and libidos, mixed with a little murder, a bit of created ritual and a large dose of philosophy. Yeah, there's nothing quite like this book out there in the graphic novel market. And while some might find this book a bit daunting as I describe it, I found it incredibly fascinating. 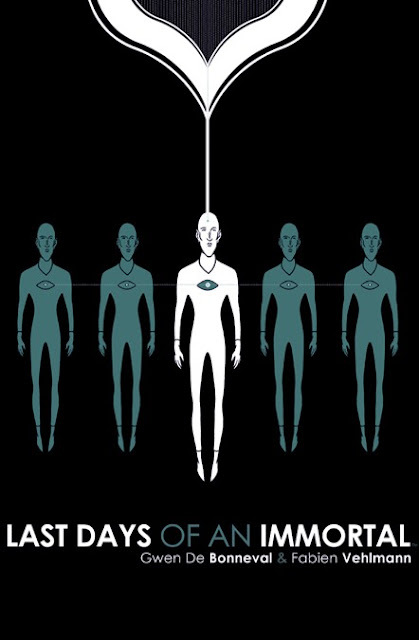 Last Days of an Immortal is a great, idea-rich science fiction graphic novel. In Fabien Vehlmann's story and especially Gwen De Bonneval's art, readers get a world that is both completely bizarre and completely comprehensible, a fully fleshed out three-dimensional world that is thoroughly different from ours. Elkin, I'm not sure what you make of this book, but I found myself bewitched by it. I adored the languid pace of the book. I loved De Bonneval's gorgeously austere artwork. I loved the complex character at the book's center and his even more complex relationships with those who love him. And most of all I loved being transported to a world that I could never have imagined and which thoroughly sparked my own imagination. Daniel Elkin: "Bewitched," "adored," "love" -- these are certainly words I could use to describe my reaction to Last Days of an Immortal as well, Sacks. This book gently applies its hands to all of my pressure points. At its heart, it is about communication and building connections, how we grow together and how we grow apart. It explores time and memory, pokes fun at philosophical pretension, and reveals how at the center of every conflict is ultimately a misunderstanding. Vehlmann and De Bonneval go deep in this book -- it's a Hail Mary Pass down the sidelines of exploring the nature of relationships, and they throw it towards those of us with strong enough legs and deft enough fingers to pull the ball in, close to our hearts. When we cross the goal line we move ahead of all of our opponents. Last Days of an Immoral begins with a murder based on miscommunication, how "the expectations we bring to the encounter" with others colors our understanding of each interaction, and then goes on to examine how each time we reach out we are "ruled by a kind of ritual theater" which prevents us from truly connecting, how our very presence in each interaction makes us culpable in shaping its outcome. It's heady stuff, to be sure, and Last Days of an Immortal engages its readers in some serious unpacking. We have our main character, Elijah, whose name is Biblically evocative of the harbinger of the Messiah, the prophet who condemns us for having gone astray but is ultimately the one who ends the drought through his faith. As a member of the Philosophical Police, his task is not really investigating crimes, but bringing to light the crossed signals of communication, finding the "ur-event" that brings about the conflict, and, through this discovery, fosters understanding. It is only through understanding, this book seems to say, that empathy is possible -- and with that empathy comes peace both without and within. And yet even Elijah, so adept at uncovering where connections go wrong, still suffers the loss of loved ones as they misinterpret him. But the beauty of this book is that even though it is thematically heavy, it carries this weight with ease. Much of this has to do with De Bonneval's art which is often open and clean. He is able to render the most bizarre and alien of circumstances in an inviting and gentle manner (although there are moments of warranted brutality as well, and De Bonneval understands when to get inky). The pages look deceptively soft, the perfect pillow for the heft of its intent. There are also moments of humor, from the attack on philosophy's "little game" to the subtle joke of "I hope Elijah can come soon." Vehlmann has the pacing down in this book which makes its 150 pages seem smaller somehow, more compact. Last Days of an Immortal is full of so many instances of brilliance. I've only scratched the surface. Jason: Yeah, and that's the thing with this book, Elkin. So much of what makes Last Days of an Immortal really wonderful only become apparent when you really get a chance to spend time on the book and allow its complex world to work on you and become alive in your mind. We've been talking around the most important and successful aspect of this book, I think: the fact that De Bonneval and Vehlmann create such a three-dimensional, complex world for the story they present. We've been pulling out all kinds of disparate elements of this book in our commentary, but maybe we're missing the metaphorical wood for the trees as we discuss it. I think the reason that both of us responded so strongly to this book was because it was so immersive, so much a work of comics art that creates a thoroughly convincing and fully fledged fictional world despite the fact that the world is so strange, so alien, so thoroughly different from anything we've really seen before. The creative team takes a central concept that we've seen many times before -- the question of how the mixture together of intergalactic races would affect all the races -- and explores that idea from a thoroughly unique perspective. How would the perception of time and space be different for each of the races? How does the perception of right and wrong, good and evil, affect the ways that crimes are adjudicated and even assessed? In a universe where mummies sing and where all interaction on a specific planet is scripted in one way or another, how does a thinking person make sense of that world? How does a character in that sort of universe maintain his sanity? And maybe most importantly for us, how does a team of creators deliver a story with such a complicated setting and still creates a relatable world? How do they actually bring readers into the story and makes us care about the complex panoply of experiences that are being presented? How do the creators avoid the temptation of simply asking their readers to be tourists, enjoying the sights and experiences but not actually experiencing them in the ways that can affect the reader's mind and move them to a different place of contemplation? The fact that De Bonneval and Vehlmann do exactly that, and do it extraordinarily well, makes this book something very special. Elkin, it's pretty clear that "the expectations we bring to the encounter" with this book ended up being very different from the experience we both had with it. How do you think the creators were successful in creating a thoroughly alien and thoroughly relatable world for us readers? Daniel: By putting us through experience itself. By allowing each of its questions to be asked and then spending the time to try to answer them. Last Days of an Immortal is never pedantic, it allows the reader to bring as much of him or herself to the experience as it does creating the world it inhabits. You used the word "immersive" to describe your experience with this book, Sacks, and it is indeed an apt adjective. For me, I found myself immersed in the ideas that Vehlmann explores here -- maybe this is a result of my particular style of reading -- maybe this is a result of De Bonneval's art allowing me the comfort of focusing on this aspect -- regardless, for me, this book is about ideas. Particularly when it is exploring the nature of communication and connections, which, as I said before, is fundamentally the purpose of this book. Extreme pleasure only offers an immediate stimulation, which no sooner than consumed, exhausts itself, and requires constant escalation. Whereas duller things never let themselves be fully grasped by our senses. They remain at the threshold of all possibilities. That's why dullness remains inexhaustible. It is this "threshold of all possibilities" that is the basis of true lasting relationships, and I think that as our culture moves faster and faster and our ability to divert ourselves from interacting with the world becomes easier and easier we grow further and further apart from each other. Living in theNOW as much as we do only seems to wall us off from holding each other's hand. Why would an immortal choose to stop being immortal? Perhaps it is to give precedence to the experience of living. "Isn't that the fate of all immortals, in the end -- to forget our past?" Without the benefit of memory, how does one cherish true experience? How does one celebrate his or her life? Our past is what we bring to our present, and through it, make sense of our lives. Our past formulates "the expectations we bring to the encounter" and thereby colors our communication with each other. We look into the eyes of the person we love and see the "threshold of all possibilities" -- each possibility an outcome of our expectations, a summation of our past, a conglomeration of our memory. Jason: Beautifully stated, my friend. For all its wonderful science fiction trappings -- for all its incredibly interesting talk of alien worlds and alien philosophies and attitudes and approaches to the world -- the real core concept in Last Days of an Immortal is intimacy. And what is intimacy but the power of sharing the experience of living with those with whom we are close? The biggest pain that Elijah feels in this book, the topic to which he returns again and again, clearly brooding about its lack in his life -- is his relationship with his once-close friend Matthias. Matthias and Elijah were once very close friends, almost brothers in fact, but somewhere along the way that intimacy was lost or forgotten in the midst of the chaos of changing bodies, complex missions and other friends. The division between the two men was so vast that Matthias didn't even invite his former friend to his funeral, an event that's suffused with deep and complex meaning in this world. Much of the rest of the book tells stories of Elijah trying to establish intimacies. Whether it's his deep emotional involvement with Iseult, the class he teaches on morality, his friend Phil sharing his good news, or even his work to facilitate communication between warring species, Elijah always is in a quest to bring people closer. He's deeply bothered by his relationship with Matthias. It's Elijah's job to facilitate communications, to make sure that all important moments are as clear and resonant and powerful as possible. And yet even a man of his great skill has a tremendously hard time managing all the connections he makes with those who are close to him. Our world has only a fraction of the complexity of Elijah's world, as you point out so well, Elkin, but our world also pushes us away from each other. In the guise of helping us interact, it also makes it harder for us to interact as real people, as individuals unconnected to the technologies that we use. Genuine human intimacy is difficult. Last Days of an Immortal gains tremendous emotional resonance from the acknowledgement of that fact. In Elijah's struggles we can see ourselves -- all our pain and worry and loss manifested in one amazing Terran. We can only struggle to try to reach Elijah's level of empathy. Daniel: Well said, my friend. Last Days of the Immortal is hands down the best graphic novel I have read this year insomuch as while it places us in a future entirely alien to our current sensibilities, it speaks directly to our present condition. It is a book with both brains and heart, and I, for one, am a better person for having read it. True thanks need to go out to the fine folks at Archaia for allowing this book to be. "Shall we start our dance of welcome all together?" Daniel Elkin is still wondering how fish and sound waves can be a single species. You can watch him try to sort this out on Twitter (@DanielElkin) while also bemoaning the lack of sandwiches in his life. He is also Your Chicken Enemy.